A “backstory” is a literary device used to lend depth and color to the main story. Characters often have history that impacts their present decisions and actions, and that history often is revealed as a ‘backstory” that helps us understand the character’s current motivations and psyche. The backstory enriches and enlightens and makes the main story line more compelling. Like an author creates a character, a woodworker creates a “thing,” and that “thing” likely has an interesting “backstory.” The backstory of your work can make what you make more compelling and more valuable. As we move from outside to in, as summer changes to fall, many of us are already planning the holiday gifts we will make for others. An interesting backstory may well turn out to be as highly valued as the object itself. Imagine your woodworking gift accompanied by an interesting backstory… the history of the piece, from idea to plan to wood to finished product. The story of your woodworking efforts will be appreciated… indeed, perhaps even cherished. And how you tell the backstory will make a big difference. Photos are an obvious choice for creating the backstory behind your project, but you will need words, too. PowerPoint and Keynote are two great programs that allow you to combine pictures and words easily. There are also a number of free photo-management programs that include the ability to produce photo albums with labels and descriptions. You could simply “paste” photos into a word processing program for an effect almost as nice. 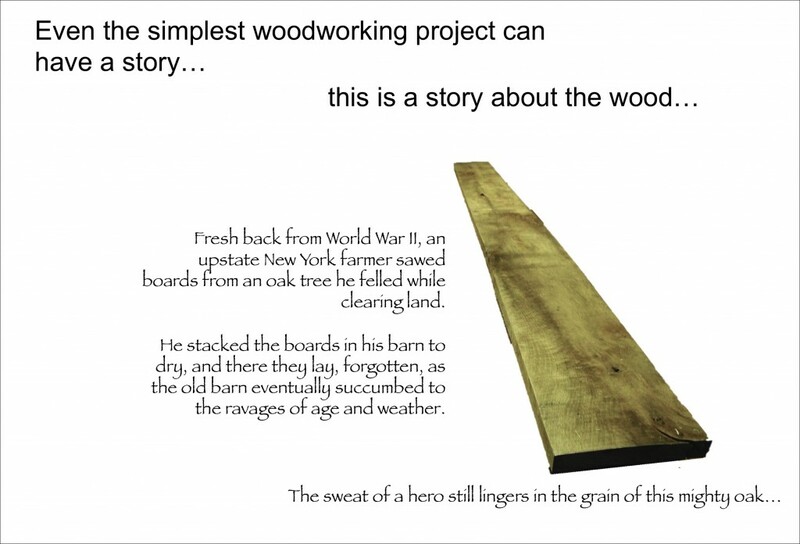 The backstory behind the creation of a woodworking project is an historical timeline, so start with the wood, the idea, or the plan. Was there something special about the wood, how it was acquired, or where? Did something about the recipient trigger the idea for the gift? Did you design the piece with the recipient in mind, and what was the motivation? From there, simply follow the timeline and show snippets of the project that might be interesting to a non-woodworker. Did you use a special hard-to-make joint? Did the project require extensive handwork? Or was a special jig made to accomplish the machine work? Did you apply a special finish? In all likelihood, the little things you do everyday will be very intriguing to a non-woodworker and will help them appreciate the thought, effort, experience, and expertise that went into your gift. With a little planning, the backstory of your woodworking project can be easily compiled. If you take pictures and keep notes throughout the project, chances are you can put the backstory into a pretty binder and finish it up about the same time you are rubbing out that last coat of shellac. Present the two items, your woodworking project and its backstory, together, and wait for the smiles. Not too long ago I had a chance to visit a friend I haven’t seen in almost five years. I had made and given him a small piece of furniture and shortly thereafter he was transferred to another city. Today, five years later, that small piece of furniture is still prominent in his living room, as is the “backstory” of the project I gave him at the same time. He told me that he has never had a guest in his house that wasn’t fascinated by the booklet describing the process, from wood to finished piece. This year, consider making a “backstory” to accompany the woodworking gifts you give. We would love to see them, too. Send us an electronic version of your backstory and we will share the best with the rest of the woodworking community right here in the Highland Woodworking Blog! Where can I find plans for building a splmie bookcase?First, I am not a woodworker. Would a small, basic bookcase be a good starting project? Because I’m visiting my parents for a few months, I can have access to a garage full of basic woodworking tools. I’m not envisioning anything in particular, just something with inexpensive wood and no wider than three feet. Any ideas?Thanks in advance.